As I promised in last Friday’s email, today I have details to share on the exciting new horseracing tipster with a profitable history betting with bookmakers and betting exchanges for you to discover. Read more about it and the exclusive half-price offer here. To his fair quoted bookmaker prices, he has made a profit of between 542 and 745 points at 22.87% and 31.42% ROI. If preferring to take Betfair SP, then this profit stands at between 228 and 365 points at 9.65% and 15.42% ROI. The profit differences above depend on whether you wish to follow as a mix of each-way and win bets or just win bets only. For more detail on this service, click here to read more. I simply had to email you all today about the fantastic 175/1 winner tipped up by SBC-recommended Premium Tipster – the ‘Golf Insider‘ yesterday – especially with the US Masters starting this week. The Golf Insider advised the Canadian, Corey Conners at 175/1 to his members last Wednesday and he duly obliged following a topsy turvy final round at the Valero Texas Open yesterday. This success added to the profits made by his 60/1 winner, Kevin Kisner in the WGC Match Play the week before and it is safe to say he is on a roll ahead of the US Masters this week. Speaking of which – the Golf Insider has just released his first 2 US Masters tips for this week (both are still widely available at the advised prices) with more bets scheduled for release over the next few days. If interested in following the Golf Insider in both this week and beyond, there is a 60-day trial available alongside a 10% discount for SBC visitors. You can read more on this service, his long-term profits since 2014 and how easy it is to follow on the exchanges and with bookmakers on the Golf Insider SBC page. If you have yet to check out the SBC-recommended tipster, Bet Alchemist then make sure you don’t miss out on the chance to follow them in for the next 30 days for just £1. This will include advice for the Aintree Grand National Meeting followed soon after by the Ayr, Fairyhouse and Punchestown Festivals during a very busy April! I highlighted this Bet Alchemist offer ahead of the Cheltenham Festival (see my email below from Feb 17th) where they made a 12.5 point profit @ 35.71% ROI from 31 bets advised over the festival itself. The first Aintree bets will be released this Wednesday at 7pm so make sure you secure your membership and first 30 days at just £1 before then! P.s. Due to the type of races Bet Alchemist focuses on, it is a betting exchange friendly service (ideal for those of you restricted by the bookies) and the quoted odds on advised tips often remain readily available. With Horseracing back on and Cheltenham now little more than just over 3 weeks away, I wanted to highlight the fantastic offer from SBC Premium Service – Bet Alchemist that will provide you access to all of their tips for the next month for just £1! That’s right, it costs just a quid for your first month with Bet Alchemist as part of a 30 day trial period and if you enjoy the service during those 30 days you can then enjoy a long-term membership at discounted rates. Best of all by signing-up today, your £1 outlay will get you full access to Bet Alchemist’s Cheltenham Festival tips, where they have a fantastic record of performance since 2010 with 70.15% ROI from 377 bets advised over the years. At £20 stakes, that is just shy of £6000 profit to the fair advised prices. Bet Alchemist is very highly rated for one simple reason – the consistently strong profits made by head tipster, Nicky Doyle at realistic and achievable odds over the years. And whilst we can’t guarantee that during your 30 day trial you will make a profit (no tipster can ever guarantee that) it should give you a real insight into why we rate this service so highly. After all – prior to becoming a SBC Premium Tipster, Bet Alchemist was featured in both the Hall of Fame and Best Tipster Guides. With the 30 day trial, you can simply sign-up today for £1, trial the service for a month and then if you find it is not for you – simply cancel before the 30 day period ends. You can do this on Day 29 if you like and will only be £1 out of pocket. However, if you like the service and want to remain a member, you can enjoy discounted membership prices thanks to our tie-up with Bet Alchemist. There are 3 different membership options available now for Bet Alchemist, all with a £1 offer for your first 30 days. Back in the 1990’s a mild-mannered American academic invented a horse racing computer program that made a small fortune. All of which made this guy one of the most successful racing winners of all time. Inspired by his success, a top UK data scientist has applied the same maths principles, which combined with state-of-the-art technology has been picking out value bets since January 2017. Over the course of 26 full months, he has made a 1071 point profit at 40.43% ROI from 1550 bets and proven his success first-hand to us here at SBC. And today, for the first time, I have negotiated a special SBC deal for those of you interested in this service, including a discounted first month and 30 day trial. Click here to discover more on this unique offer. P.S. It’s not just the profits made but the operation of this service which appeals as it supplies 4 tips via email and SMS from 11.15am each day. Making it very easy to follow with a strike-rate of 36.29%. Take a look at The Winning Machine. With no Horse Racing taking place until this Wednesday (at the earliest) I have brought forward details on a special deal now available via SBC with the greyhound tipping service – Top Dogs. Having proofed a profit of 172 points @ 18.35% Return on Investment since November 2017, the Top Dogs service has showcased very strong profitability over the past 16 months. They have also impressed with the quality of service on offer, how easy it is to follow and the fact there is no price pressure on the odds of the tips supplied. For those of you interested, I have negotiated a special SBC deal whereby you enjoy a risk-free 30 day trial and a 50% discount on your first month with Top Dogs. Long-running SBC Premium racing tipster offering: The Value Services have today introduced a series of new and affordable membership options for those of you keen to sample their winning advice, including a 14 day refund request option. The Value Services encompasses a trio of tipping options all based around the headline ‘Morning Value Service;, which has made 4412 points profit from 44600 bets at a ROI of 9.88% and ROC (bank growth) of 1470.78% since 2011. With options available for Morning only, Evening only and even Festival only tips (plus all of them combined), you can now sign up at lower monthly membership rates for all 3 and with a 14 day refund policy to boot. Feedback from those of you interested in the Morning & Evening Value Services suggested that you would like the chance to sample them at more affordable rates first of all, to see if they suited your betting requirements. Which is why we have introduced these lower monthly membership rates, whereby your first months membership payment is significantly reduced and thus allowing you the chance to sign-up at a lower fee and see whether or not the service is for you. Used in conjunction with the new 14 day refund policy, this even allows you the chance to sign-up, sample the service for 14 days and if you feel it is not for you, request and receive a full refund. This new refund guarantee states that if you sign-up for either the Morning or Evening Value services and would like to cancel your membership and receive a full refund, you can do so within the first 14 days of signing-up. All you need to do is simply notify us within your first 14 days membership to receive a full refund. There is no catch – its a genuine offer to allow you to trial it. This offer is only applicable to those without a prior or existing Morning or Evening Value Service membership and to protect it from abuse – can only be used once. The refund offer does also not apply to the Festival Value Service due to the spread out nature of tip supply. As it’s nearly Christmas I have a special festive racing deal for you, where you can trial the very popular ‘The Value Machine’ service for just £1 for 14 days. If signing-up today, your £1 outlay will cover all the racing over the Christmas and New Year period and provide plenty of opportunity to see what the fuss is all about with this popular service. One SBC member – D.G. made 255 points in his first 3 months with the service. Sign-up here for a The Value Machine subscription and pay just £1 for your first 14 days. After 14 days have elapsed, unless you specifically cancel the subscription, the normal monthly fee of £57 for access to The Value Machine will kick-in. If you don’t wish to pay £57, simply cancel your The Value Machine subscription at anytime during the first 14 days (you will still get a full 14 days access) and you will not be charged more than £1. If you like the service then you can keep your subscription and enjoy the long-term benefits it provides. This special £1 offer will only be available for a limited-time only and is available once per person to those new to it. Click here to sign-up for 14 days for just £1. Back in Mid-September, I highlighted the ongoing excellent form being shown by tipster – The Scotsman from the Scottish Football Income Booster service and the good news is his strong performance shows no signs of abating. As of current day, for the 2018/19 season, he is now up 36.38 points from 90 bets and all at a ROI of 28.87% – having added an extra 18.25 points profit in 59 bets since my email on the 13th of September. For those of you keen to find out more – I invite you to download the full results sheet for this service (opens up a Excel spreadsheet file). Here you can view line-by-line all the results since day 1 of the service and exactly how the profits have been accrued. As an SBC member you can now also subscribe to the Scottish Football Income Booster with a 30 day anytime money back guarantee. This enables you to sign-up immediately and if for any reason you are not happy with the service, you can get a full refund within your first 30 days. Effectively you can sign-up today, try the service out for size and if it’s not for you, request your money back and walk away. Even if you decide to do this on Day 29. Should you wish to continue as a member after the 30-day trial ends, the cost stands at £37 + VAT per month. To find out more and grab your membership space, please visit the Scottish Football Income Booster page. The winners keep coming for the SBC-recommended tipster, the Golf Insider and since my last email on the service (sent 23rd September) to the advised staking plan its added a further £1,859.75 from an extra 71 bets. This form has taken the overall long-term profit tally from £15,832.92 up to £17,692.67 and at a new ROI figure of 14.88%. Below are the full figures…. …But this email is not to tell you what you might have missed, but to encourage those of you yet to do so, to check out what is offer with the Golf Insider. Betting Exchange friendly, the Golf Insider’s settled strategy has reaped regular rewards since 2014 from a total of 1940 bets. There is also a 60-day trial and 10% discount on offer to you as an SBC member. Don’t simply take my word for the success of this service – instead look at the full line-by-line set of results achieved by the Golf Insider since 2014. These results showcase the long-term success of the service, and whilst with any Golf tipster, patience is required (as it always is when backing at high odds) the rewards are there. For more information on the service including the 60-day trial and 10% discount click here. 2018 continues to be a very successful year for SBC Premium Service – Football Lay Profits with another winning month in October (12 points profit @ 5.4% ROI) to add to the growing profit tally. The success of this service is no flash in the pan because as we approach the 2 year anniversary since launch, it has advised 1143 lays and made a total profit of 233 points at a ROI of 5%. To the average 150 point betting bank we advocate, this is betting bank growth of 155% in nearly 2 years. Football Lay Profits as the name indicates, provides lay tips with a high strike-rate of around 82% across all major European football leagues. Its a service well suited for those of you who use betting exchanges such as Smarkets, Matchbook and Betfair and looking to diversify what you bet upon. The average lay this year is priced at around 4/1 and it works to a simple 1 point stake on each lay to easily obtainable prices. You can view a full spreadsheet of results via this link. Although 2018 is up 78 points profit to our official figures – the reality is that by using different exchanges, you would have made a much higher return. This is because we deduct the 5% Betfair baseline commission as standard off each lay when it wins, even though most punters won’t be getting charged that sum. The more you use Betfair, the lower your commission level is – and of course, if you use any of Smarkets, Betdaq or Matchbook, the commission rates are much lower. Smarkets & Betdaq charge just 2% as standard, whilst Matchbook’s commission rate is also low. All 3 of these firms are considerably lower than Betfair and their 5% base rate…Yet this is what we use for our results at Football Lay Profits. To showcase the difference it can make, here is our official record if taking 5% versus 2% commission. A difference of +10.59 points profit over 441 lays! You can now secure your membership to Football Lay Profits with monthly, half-season and special full season options available. The full season option takes you up to the end of July 2019 for just £30 per month. Best of all, you can also join with the peace of mind of the 30 day money back guarantee we offer new Football Lay Profits subscribers. Enabling you to sign-up and if you find it not to your liking, you can request a refund at any point within your first 30 days. To get started – simply visit the and follow the FLP subscription links. Those of you after a unique, fully customisable racing tipster could do a lot worse than check out the highly recommended SBC Premium Service – The Value Machine as it continues to impress. But don’t just take my word for it, instead listen to one SBC member – D.G, who sent this unprompted email earlier this month on the profits he has made following the Value Machine. “As it’s been 3 months since I’ve been using the Value Machine I thought I’d drop a line to say how it’s gone for me. Bloody fantastic !! Up to yesterday I have 255 points of profit. I’ve settled on settings of 3 to 11 and aim to get 25-30 bets on per day. My plan at the start was to try to get 1000 points profit in a year (have to say I thought it cloud cuckoo land at first but I’m on target). It was an odd feeling at first betting on a concept rather than some bloke sending me a list of selections but this Machine just works. Having said that I had a rare losing week just gone dropping 30 points, but that’s the only one I’ve had. Had to write as I’m absolutely delighted with this service. SBC state that ‘you run the machine, put your bets and collect your money’ which pretty much sums it up. What D.G. (he asked me to only use his initials to protect his identity) refers to above are the customisable settings that the Value Machine provides. He has chosen to back selections considered value when priced between 3.0 (2/1) and 11.0 (10/1) at a time each day that suits him. Which is the real beauty of the The Value Machine as you can choose which day and time you want to bet PLUS the profile of bets that suit you and the bookmakers you can bet with. Then Value Machine software is here to help. To best illustrate how the Value Machine works, I have recorded a simple walk-through video that explains how easy it is to use. It should only take 6 minutes to watch and helps to neatly summarise everything that it offers. For more details on the service, the exclusive SBC member deals available, results and a lot more – please visit The Value Machine Premium Page. This Friday sees the start of the Ryder Cup tournament and whether you are a big Golf fan or not, there is no doubting that Golf Betting when done right can be extremely lucrative. …And one person making the most of Golf value betting opportunities is SBC Premium Tipster – The Golf Insider who has shown an exceptional talent for making long-term profits on the sport. Actively tipping since 2014, we have long recommended him for one simple reason – his outstanding record which to date has seen him make a £15,832.92 profit from 1869 bets at 13.63% ROI. This profit record is based on a mixture of mostly Outright tournament tips (with an average price of 80/1) and extremely successful additional 3-ball bets. Stakes range from usually £10 to £25 each way on Outright tips and £50 to £100 on the less frequent 3-ball tips, yet can choose to follow at the stakes you prefer. With around 10 bets in total each week advised on Tuesday and Wednesdays, there is no pressure on the odds quoted making it relatively easy to follow. Especially as the quoted odds can usually be matched or even beaten by using either Betting Exchanges offering Golf betting markets (Betfair, Smarkets & Matchbook for example) alongside your traditional Bookmakers. Making the Golf Insider the right kind of long-term profitable and sustainable service for a professional tipster portfolio. If you are interested in the Golf Insider service, there is an exclusive 60 day trial and 10% discount offer available for SBC members. You can read on for more on this unique offer via the Golf Insider SBC page, where you also can find details on the service, how it works and links to sign-up. Be aware though that the Ryder Cup starts this Friday and the Golf Insider will be sending his first bets for the tournament on Wednesday so make sure you sign-up before then if interested. Through the trial offer, if you like the Golf Insider service, you can take up a membership but if its not for you, cancel the trial and get a full refund. Best of all, you have 60 days to make your decision. Simply visit the Golf Insider for more information and links to sign-up. Back for another season with a discounted membership is the SBC Premium Service: Scottish Football Income Booster. Featuring football betting advice from The Scotsman’ – a bonafide expert on the 4 leagues north of the border, the service continues to rack up the profits for those onboard. Starting out in August 2015, over the course of his first 3 full seasons, The Scotsman made a 135 point profit at 14.09% ROI from 620 bets to showcase his expertise. And he has also returned with a bang this season after bagging 18.13 points at 36.26% ROI from his first 30 bets so far. Supplying a mixture of easy-to-follow 1X2 and Over/Under bets for games across all 4 Scottish football divisions, its easy to see why we recommend the service. Especially as it comes with a 30-day money back guarantee AND cheaper memberships for the 2018/19 season. To find out more and get this weekend’s tips from The Scotsman, click here to read more. Those of you interested in the Racing Bet Profits service can now secure one of 25 new membership spaces just made available. Supplying an average of 3 to 4 daily racing tips and profitable at both bookmaker and Betfair SP (minus commission), this service continues to go from strength to strength with another profitable month in June so far. As of the 27th June, to Bet365 odds, a profit of 24.14 points has been made at 18.86% ROI, whilst at Betfair SP its been even better with a profit of 44.03 points at 34.40% ROI. Of course, what matters more is the long-term record and after 13 months and 1419 tips, the records at both Bet365 and Betfair SP odds continue to be strong as the tables below indicate. Memberships are being limited to protect odds availability for subscribers to this service and only 25 spaces are on offer – so grab yours whilst you can. The cost to join is just £47 per month – take on a recurring monthly basis which you can cancel at anytime. Full details are available at the Racing Bet Profits page. It’s been a fantastic June so far for SBC Premium tipster, Bet Alchemist and with an exclusive £1 deal for you to sample this exceptional service for 30 days, its a great time to sign-up and see what all the fuss is about. Winners this month include the likes of Ostilio (16/1 at Royal Ascot on Tuesday), Alfredo Arcano at 16/1, Shore Step at 10/1, Via Serpendidty at 6/1 and Study of Man at 5/1. To ensure independence we removed Bet Alchemist from our June Tipster Profit Report (as we do for all SBC Premium Tipsters) yet it continues to pick up the profits and deserves your attention. Bet Alchemist is very highly rated for one simple reason – the consistently strong profits made by head tipster, Nicky Doyle at realistic and achievable odds since 2012. Over this 6 year period, 511 points profit have been plundered at an ROI of 15.20% from more than 3150 bets. It is this strong long-term form, coupled with the professionalism of service, obtainable and realistic odds for both bookmaker and exchange users that have led us to secure Bet Alchemist as an SBC Premium Service. Best of all, you can also sign-up for just £1 for your first month (with a full 30 day guarantee) and enjoy ongoing reduced membership rates once your first 30 days are complete. Full details on performance and how you can sign-up can be found at the Bet Alchemist SBC Premium Page. Those of you reading Rowan’s Bet Diary blog last week might well have noticed how Monday May 21st will be a day that will go down in history for him – thanks to 4 winners that returned over 300 points profit from just 14 points staked. These winners were all supplied by SBC’s very own winning strategy – the Fake Mug Bets Club, something I (and now Rowan) have been religiously following for several years now with great success. It’s a strategy I can wholeheartedly recommend to you as an SBC member, especially if you are looking for a proven, under the radar and easy to follow method that has worked since 2013. With ROI figures ranging from 34.67% up to 284.46% and with over 3030 points profit since 2013, the stats are there to show how it has won long-term. 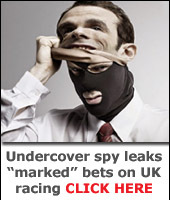 But I can assure you the “disguised” bets you can find out about by clicking here, definitely make you appear to look like a total mug to the bookmakers. Yet in truth, you are simply pretending to be a loser as you wait, hidden in plain sight for a big winning day like we saw on Monday the 21st May, which returned £3306.30 profit from just £140 staked. Since the Fake Mug Bets Club strategy began back in 2013 there have been many days like Monday the 21st May with big returns from just a few simple, multiple bets. As its a low strike-rate method, it does require patience and I will be honest with you – 99% of most regular punters don’t have what it takes to follow my lead and to win from this high profit, low stakes strategy. And if you think differently from the vast majority of punters…then it will work for you. I am delighted to reveal that SBC have teamed up with long-running Hall of Fame and ‘Best Tipster Guide’ tipster – Bet Alchemist to provide an exclusive £1 deal for you to sample this exceptional service on preferential terms. You can sign-up right now for just £1 for your first month with Bet Alchemist and also enjoy significantly discounted 1, 3 & 6 month options via this special SBC-members only deal. Over this 6 year period and more than 3000 bets advised, in excess of 500 points profit have been plundered at an ROI of 15.93% and ROC (Betting Bank Growth) of 342%. It is this strong long-term form, coupled with the professionalism of service, obtainable and realistic odds for both bookmaker and exchange users that have led us to secure Bet Alchemist as the latest SBC Premium Service. In turn this has allowed us to secure this preferential deal whereby you can sign-up for just £1 for your first month (with a full 30 day guarantee) and ongoing reduced membership rates. By signing-up today you will also get in ahead of what promises to be a busy week for Bet Alchemist with bets expected every day at the Punchestown festival (Nicky has a tremendous track record at the big Irish meetings as this review outlines) as well as at Sandown on Friday and Saturday. Full details on this offer and how to take it up can be found at the new SBC-Bet Alchemist Premium Page. With no horse racing on today (and the forecast bad for coming days) I though it might be useful to discuss the ongoing strong form of the SBC Premium Service, Football Lay Profits (FLP) especially as we have just re-opened it to new members who wish to join. Following on from a superb January for FLP subscribers, February continued the upward trend as it ended up 8.9 points in profit from 45 lays advised. 2018 as a whole is up 38 points profit from 111 lays. All in all, its been a very encouraging start to the year, which continues to build on the long-term profits as built up by the service as the table below reveals. The average lay this year is priced at 4.36 (a smidgeon over 10/3 in old money) and it works to a simple 1 point stake on each lay to easily obtainable prices. Although 2018 is up 38 points profit to our official figures – the reality is that by using different exchanges, you would have made a much higher return. Mindful of the fact a number of you have been in touch with questions about laying – from the overall concept of it through to where you can place their lays, I also ran a few questions past the tipster behind the service – Jon Roberts. SBC: Why do you feel football laying has been such a profitable angle for you and what would you say the appeal is for those new to the idea of laying? Jon: It’s funny in that I’d ignored laying on football for a number of years as I subscribed to the misguided view that you couldn’t really make money from it, that the markets were too efficient etc. That changed once I was able to put some intelligence into it and look what the data was telling me. This showed quite clearly that there were actually many profitable angles that could be taken when laying. Laying is a little divisive at times, you’ll have people who love being able to do it whereas others will dismiss it out of hand. What I have proven to myself initially and to Football Lay Profits members is that it is not as cut and dried as all that. After all, if you replaced the word ‘Lay’ with asian handicap (+0.5) or double chance, your perception maybe different – yet all three markets are effectively the same. SBC: What do you think the advantages of laying over backing are? Jon: For me the advantages of laying are four fold.1. It is good for the soul. We put emphasis on patience, long term thinking and how to deal with losing runs and it is all correct and sage advice. But it sure is nice having a model in the portfolio that delivers lots of winners on a regular basis – it can be very handy for morale at the tougher moments. The long-term strike rate sits at 83% so roughly 5 out of every 6 lays will ‘win’ for us. 2. Laying adds diversification to your portfolio and as any investor will tell you – be it gambling or shares – diversification is key to any successful portfolio. 3. When done right, like we do at Football Lay Profits, it will deliver long term and steady profits and bank growth. Other approaches may deliver more rapid growth, but they also have bigger swings, so it’s nice to balance that out against a no frills. long term profit making approach. 4. Most importantly – you can only lay on an exchange so its ideal for those punters unable to bet with bookmakers or looking for scalable options that won’t get closed down if they win. SBC: Speaking of exchanges, which firms would you recommend holding accounts with to maximise the returns from the Football Lay Profits service? Jon: We take the price from Betfair when recording our results at Betfair, along with a 5% commission deduction. This just ensures a consistency of reporting. Although whether you want to place these lays with Betfair might depend on your commission level with them – if its 5% then you might want to look elsewhere. Personally the majority of my lays will go on to either Betfair or Matchbook, depending on the odds and any promotions around commission. The only reason I don’t use Smarkets at this time, is due to some account opening challenges based on my current location and their KYC process, which is a little more involved. I do know though that many of you at SBC use Smarkets a lot, and it is worth the effort to open the account if you can, so I would recommend adding them into the mix too.Recently, Betdaq also slashed their commission rate to just 2% to go into direct competition with Smarkets, so they also provide another option for you. Ultimately, you can’t go wrong with any combination of Smarkets, Matchbook, Betdaq and Betfair – simply choose those where you have the lowest commission rates, best promotions and best odds. You don’t need accounts with all 4 to make a profit, but the more you have, the greater the overall profit you might be able to pick up, especially those with lower commission rate firms. My thanks to go to Jon for taking time out to answer my questions. For those of you keen to find out more on the service, there is further information on the Football Lay Profits page, where you can also find subscription links. All subscriptions come with a 30 day guarantee that enables you to sign-up and if not for you, claim a refund within your first month of membership.There is a limit on membership numbers so if keen to sign-up, be advised to do so sooner rather than later to avoid disappointment.